2017 Volvo XC90 Reviews Highlight Luxury and Passenger Space! 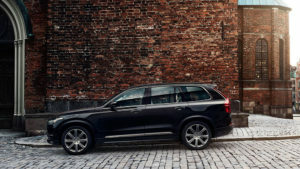 The newest Volvo XC90 reviews prove that this latest model lives up to its extraordinary reputation for luxury and functionality. Yes, it’s solid. Yes, it’s well-equipped with everything you need. But, the XC90 is so much more – it’s an SUV that delivers roomy elegance on the inside, modern style on the outside, and a luxurious alternative to run-of-the-mill SUVs. The automotive world has always loved the Volvo XC90 for its excellent performance, particularly when it comes to safety and crash tests. The media also lauds the XC90’s stellar fuel economy and host of upscale amenities. Between its premium components, roomy seating, and spacious cargo room, this SUV is perfect for just about anyone. U.S. News & World Report also notes that advanced safety features come with every XC90, such as lane keep assist and automatic emergency braking. Reviewers highlighted the fact that high-tech gear is found throughout the XC90 lineup, including an expansive 9-inch touch screen, navigation capabilities, and a hands-free tailgate. You just have to feel good about the Volvo XC90 reviews! All of our sources agree that the fabulous amenities, cargo room, and passenger space make this SUV is a winning option. Take the opportunity to experience driving the XC90 for yourself at Sullivan-Parkhill. We’d love to get you behind the wheel and answer all your questions. Contact us today!